I am five days into my first trip to Turkey, it is 2004. 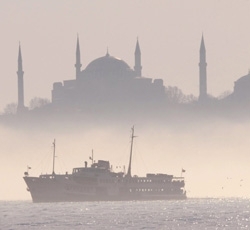 Sitting on a boat in the middle of the Bosporus, I am trying not to cry. My boyfriend is holding my hand and ordering tea for me as the ferry sways from side to side. 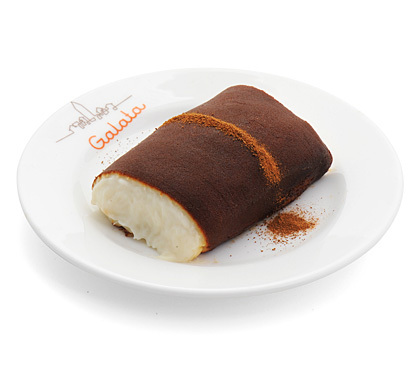 We are on our way from Kabataş (kabah-tash) up to the Sariyer neighborhood – he wants to show me an amazing shop that sells Tavuk Kazandibi, a dessert delicacy he tells me is made with caramelized milk, sugar and shredded chicken. Always up for a culinary diversion, I jump at the chance today as my brain is feeling oppressed at trying to make out Turkish all around me. I am hating myself for feeling angry at all the Turkish, angry that my brain hurts and that my mouth muscles are sore from smiling through hours of conversation I do not understand, waiting for the comforting squeezes of my boyfriend’s hand, or the apologetic glances he makes when efforts to switch to English are rebuffed ever-so-gracefully. I hate myself in these moments, because what kind of entitled ugly American tourist am I who wants everyone to speak English? Yet, I am exhausted. In the secrecy of our bedroom that night, I try to explain my feelings and he tells me how frustrated he feels FOR me…we argue a bit – about all the “just dropping in” we are doing to all of his friends. “It is so rude,” I say, “to just drop in without calling.” He sighs, clearly tempering his response into a not-gonna-be-an-argument as I am adjusting to all this and he is the primary person responsible for me adjusting, for my happiness on this trip. “But this is how we do it in Turkey?” he says, adding the questioning intonation on the end in order to temper his exasperation, or at least what I imagine is his exasperation. Holding me close, he says “I wonder if it was a mistake to come here – maybe this is too hard.” Exhausted, I am out like a light in under a minute. Fading in and out through the ever-thickening smoke as I feel myself pulled back through a pinhole from observing this scene, I can now only see the two men in miniature. I can hear their tinny, crackling voices as if from afar, Lilliputians in some new world. They are fighting and arguing in Swedish – at least it sounds like that. I can’t make out what they are arguing about, but before long, I can see the swells of water from where the boat capsizes, the jester thrashing wildly in the surf, while the teacher sinks from holding on to his heavy textbook on the art of boating. As the tiny figures swirl in their ocean, I am pulled through the pinhole as if in a whirlpool, my worst fear is coming true, I am drowning, I think. I wake up gasping for air. 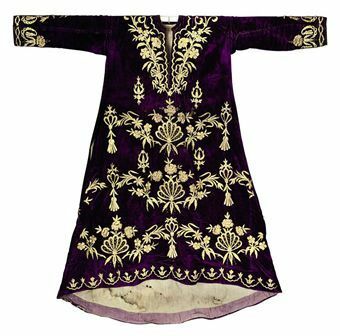 An Ottoman-era deep purple velvet kaftan with gold brocade has fallen on top of me from where it was displayed on the wall…it is the wedding kaftan of my boyfriend’s grandmother. Post-script: Years later, as I revisit this memory, I realize with a Home Simpson-style “duh” that this was part of my culture shock experience…I was so convinced that I was ready to travel to Turkey because of all of my reading, that I couldn’t imagine that I would be surprised by anything, and the hegemony of wanting to be a culturally competent (not yet knowledgeable about the culturally responsive concept) American tourist who did not insult anyone and “got it” was oppressive. 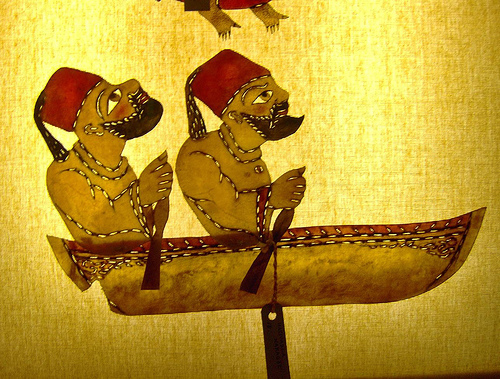 This entry was posted in Cross-cultural learning moments, Karagöz puppets in dreamland and tagged argument, boat, Bosporus, cross-cultural, dream, istanbul, Kabataş, Karagoz dream, ottoman kaftan, Tavuk Kazandibi, ugly American. Bookmark the permalink. I can so relate to the fear of the shadow of the Ugly American following me in Guatemala when we returned summers to our adopted daughter’s birth country to “stay connected” for her, for us, to learn her culture. We stayed in a language school, butchering Spanish, summer after summer; hoping that at least we were helping the local community by buying their beautiful hand made goods. We were gringos and there was no way to soften our presence. What saved us were the mothers. They loved our children and we loved theirs and we spoke a universal language, mother-tongue. We have kept in touch with some of these families over 17 years. 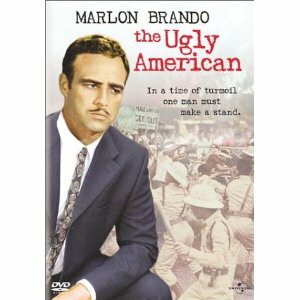 I think so many of us can relate to the shadow of the ugly American. I love this story that you shared – it gets at the best possible way people can connect – even without language, just with love. I think that there is a real power in traveling with children – let me make that conscious travel with children. Thank you so much for this, JC!